The Six Tones and Friends are doing a special performance at the beautifully situated Kalv Festival. This edition of The Six Tones features apart from Stefan Östersjö and I, Nguyen Thanh Thuy (Dan Tranh) and Tri Minh (laptop). We will perform a program of improvisations and traditional Vietnamese music. The idea of the Kalv Festival is to create a forum where new music can develop and reach new audiences. The festival was held for the first time in 2004, and is an annual event. In addition to concerts we want to create a forum and a form for development with the aim of strengthening the position of contemporary music in society. With this in mind we have set up the Project Lab, where ensembles, composers, and anyone who works with new music can run their own development projects in cooperation with people who work in other areas of society. These might include both other art forms, science, social institutions, trade and industry etc. The Kalv Festival will be a meeting-point and a reporting forum for the Project Lab. The Kalv meeting-point will also offer organisations from musical life the opportunity to meet for conferences and seminars, and forge new contacts. Some of the seminars will be open to the public and linked to the festival itself. The Kalv Festival is being arranged by the Kalvfestivalen society with support from Region Västra Götaland, Rikskonserter, Svenljunga municipality, the Swedish National Council for Cultural Affairs, The Royal Swedish Academy of Music, Levande Musik, the School of Music and Music Education at Göteborg University, Borås Art Museum, the Kalv Village Community and others. 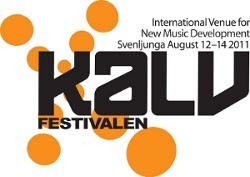 The Kalv Festival offers a meeting-point for organisations from musical life and for people interested in music. We believe that new music is best developed in the encounter between composers, musicians, audiences and society. By holding ordinary board meetings, conferences, etc in Kalv, contact with other people active in the field of new music can be spontaneous and congenial. We also invite members of the public with an interest in music to join us in Kalv to attend a series of seminars around the festival's concerts. The Project lab is the part of the Kalv Festival that runs the whole year, offering the opportunity to run development projects where ensembles, composers, arrangers, etc. cooperate with branches of knowledge in the humanities, natural sciences or social sciences and/or with other forms of art, crafts, trade and industry etc. The Kalv festival will mark the beginning and conclusion of the projects. The aim of the Project Lab is to channel creative support from other areas of society to the new art of music, just as society will benefit from new music's specific way of formulating our contemporary reality.